Classic stoneware bakers with oven-to-table convenience. EXCLUSIVE Perfect for casseroles, pasta dishes, roasted vegetables, desserts and more, our stoneware bakers feature does-it-all versatility and a simple, classic style that’s great for tabletop presentation. Set of three bakers nests for space-saving storage and includes tight-fitting plastic lids for easy transport. 3 qt. : 7.75" x 11.5" x 2.5"
1.5 qt. : 6" x 9.5" x 2"
0.75 qt. : 4.75" x 6.75" x 1.75"
I initially loved these so much I bought 2 sets. Every single one of them have cracked completely through and have needed to be thrown out. I do not use them at high temperatures nor on the microwave so the only conclusion is that they aren’t heat rated as indicated. I can see having one bad set, but two is two too much! IT is very nice to have plastic lids to store but they are very heavy to lift and move around in frig. I love my yellow oven to table stoneware bakers! I wasn’t sure if I would use the little one, but it’s perfect for taking my lunch to work in, and is a great amount for 1-2 meals. So glad I bought them! I love these baking dishes. I have 2 sets of them. I have at least 3 in my freezer right now. 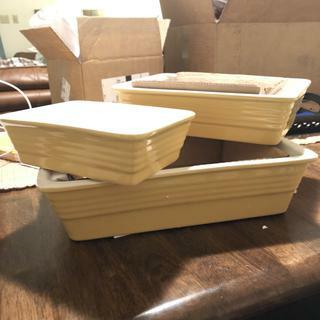 I am very pleased with my purchase of the stoneware set with lids in yellow. The food was baked evenly and it was so nice to just pop the plastic lid on the leftovers and stow them in the fridge. The yellow really adds a pop of color to my dinner table. These are beautiful and substantial. They bake well too. And I love that they have lids as I'm trying to use less disposable items for storage. Nice, heavy baking dish. Nicer than I expected. Great product. Great price. Love that they come with lids. Love the sizes. Purchased them on sale, and the price was great. Would recommend them. Such a great deal! Love! Great set, came right in time very much to my happiness as it saved thanksgiving dinner! Has held up so far and the sizes have been very useful for difference sides and mains for my family of 5. These are WONDERFUL and there is a size for EVERYTHING!! Highly recommend!!!! Cons: large dish very heavy when filled. Would prefer a slightly larger lip to 'hang on to' so it would be less likely to slip. These are the best cookware with the most usuable features. It cleans up so easy, I couldn't believe it. And it is save to use in the microwave. 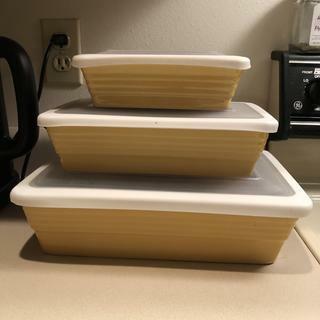 Love the color and the different sizes in the set with lids for storing left overs. I purchased the set of 3 red with silicone lids, wonderful, but not tight fit, large lid leaks a little, but contents still stay warm or protected in refrigerator. We love these and have two sets! They are perfect for cooking ahead and having the lid for storage. Oven to table, to fridge. Love the bright yellow color and glad to have lids instead of covering with plastic wrap or foil. We have a convection oven that is just a bit to small for our current baking dishes, but these will work perfectly! multiple pieces, neutral color, good wedding gift. I like The option of haveing stoneware with lids for easy cleanups and storing of leftovers after meals, especially Holiday meals, because I prepare MANY MANY side dishes . These look like a great option. I will order more sets if these work out. My aunt cooks often, especially on Sundays for the family. The set which included lids was great for the price. My daughter wanted bakers that had lids, but could not find one that was large enough. As a single gal, she can use all three sizes! My daughter got them as a gift and I wanted a set. Needed new serving items and this is durable and can be cooked oven to table. It's great! So useful to go straight from oven to storage. Your stoneware is wonderful. I own other pieces. I have wanted bake ware with lids and these are elegant looking. I bought a set of these for my daughter for her new apartment. I recently went to visit her and saw how much she like them and how useful they are, so decided to buy a set for myself! My cousin has a set. I use it whenever I'm at her place. great deal of the day! My daughter requested for Christmas. I liked the casserole dish with a lid. Would buy more of the same in different sizes. Like that the bakers had lids for easy refrigeration. BEST ANSWER: No, they're not. I bought a three piece baker set. Unfortunately the middle size one broke. Is there a way to purchase one baker from the set? I bought these to use for potlucks. Any recommendations for a good casserole carrier that fits these bakers? Do these stack inside each other well for storage? BEST ANSWER: Yes, they stack perfectly within each other. Yes, they stack inside each other well. BEST ANSWER: Although I can't answer your question because I have not used the lids in the microwave, the bake ware is beautiful, easy to clean, practical for taking places and storing the leftovers, and sturdy. Undoubtedly the manufacturer can help with your question. The lids are microwave safe. Just remember to loosen before microwaving. The bakeware is sturdy and easy to clean, and the lids are snug fitting. My only complaint is that they are quite heavy. In general all the plastic lids are microwave safe. Just remember to allow a small gap between the food and the lid or wrap, and leave one corner open to allow steam to escape. I don’t know as we don’t own a microwave. Please call customer service if not referenced in the description. Yes, but I wouldn’t put them in the dishwasher. I’ve noticed that mine have shrunk a little from that. I have not used the lids in the microwave...only for food storage so cannot answer this question. The lids that I have for the bakers are not for microwave use. Sorry I don't know. Bought them as a wedding gift. Can this be used in a toaster / countertop oven? BEST ANSWER: The largest baker measure 12.5” long x 9” deep and fits with space to spare in my Breville Smart oven. As for the average toaster smaller than a smart, it may not fit. Please measure your toaster oven. I haven't tried that. The sizes of the smaller ones would fit, but I don't know about how the stoneware would react to the heat. I'm very happy with them for regular oven use. Absolutely! The small and medium size fits perfectly in my convection counter oven. It’s wonderful that what’s left over you can just put the lid and into the fridge. I would imagine, but have only used in microwave and standard ovens. I love that these bakers have lids for keeping leftovers. I’ve never tried to use them in a toaster I use them in the oven mostly. Yes .. I have used it in my Breville Smart Oven Pro. Do these work well for freezing and baking later? BEST ANSWER: yes stoneware is fine for freezer to oven because it is not porous. be careful with the plastic lid if you have it in the freezer, as it may crack when removing from the baker. actually, I do not recommend putting lid in freezer for that reason, but if you do so, be very careful when removing lid from frozen base. Yes they are freezer safe. If you wanted to bake after freezing, it might be helpful to defrost in the fridge first, I might worry about the extreme temperature change from freezer to oven, possibly causing damage... however I've never tried it so not positive. BEST ANSWER: Definitely (given they are oven safe, minus the lids). We run these through all the time.